November’s ride followed a request that we explore the much talked about cycle routes in London. So I devised a route from Kings Cross to take in a number of different features. We started with the contraflow cycling in one way streets south of Kings Cross linking us to the Seven Stations route through Bloomsbury, which is currently a lane on each side of the road as an 18 month experiment and which is now going through an inquiry to decide if it should become permanent. This was followed by a taste of the 1980s approach to cycle routes wiggling south to Covent Garden. 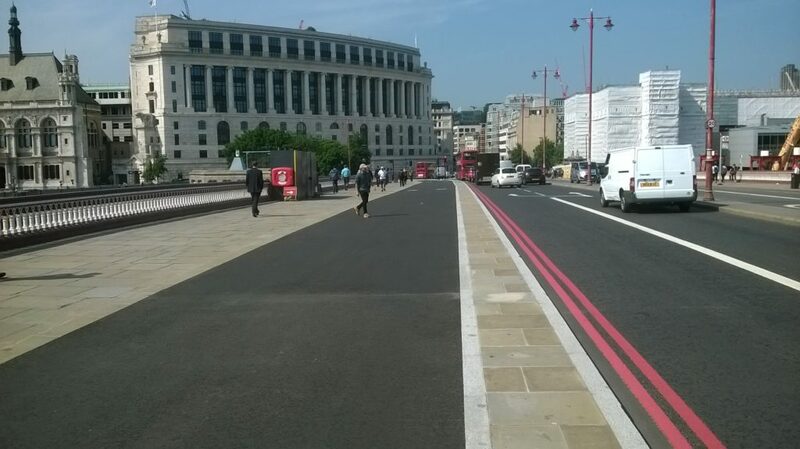 The Westminster approach to a cycle route, which is a logo on the tarmac was next. We got hooted by a taxi on this stretch round the rear of the Royal Opera House to Waterloo Bridge. In the shadow of the Houses of Parliament at Westminster we joined the new East-West cycle superhighway route along the Embankment, which showed how vastly superior this is to anything seen before. 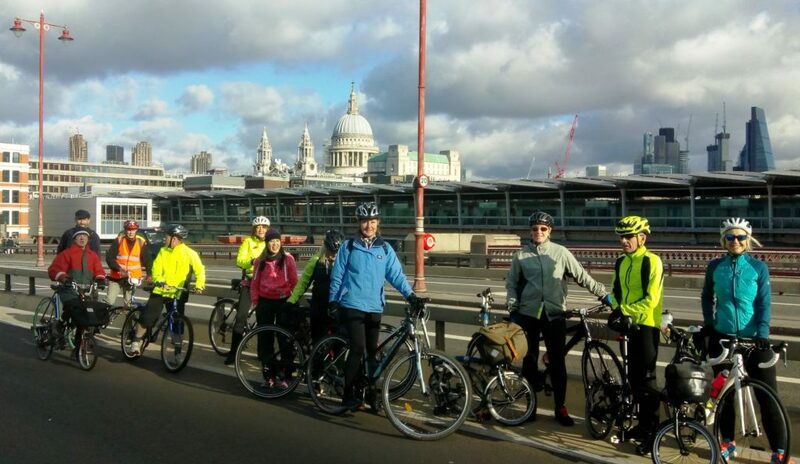 At Blackfriars Bridge we paused for a team photo on the north south new route. Blackfriars station is the zig-zag roof in the background. 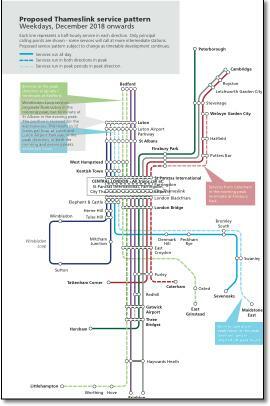 Trains from Welwyn Hatfield will be running through to this station in 2018. After lunch we experienced an original Boris Johnson cycling superhighway. Lots of blue paint except where cars have to park or at junctions, in other words a cycle route which gives up when the going gets dangerous. Back on the Embankment we then headed for the Tower of London and then a return ride to Farringdon, from where back streets through Hatton Garden took us back to Kings Cross. 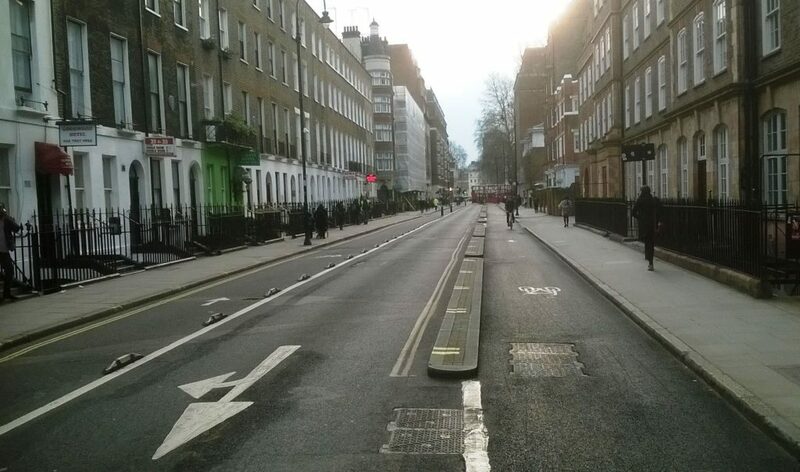 This is how wide a good quality cycle route needs to be. If you want to see these in Welwyn Hatfield, please join us.